Will you be shopping the Nordstrom Anniversay Sale? Early access (see workaround below) starts tomorrow July 12th, access to the general public begins July 20th and the sale ends on August 5th this year. I typically ignore the infamous #nsale unless I spot something really cute. Personally I haven’t had a lot of luck shopping at Nordstrom which explains why you rarely see me covering Nordstrom finds or their sales unlike other shopping blogs. This year I placed 5 orders and being the return queen that I am, the only item I managed to keep are these Topshop Jamie high waist ankle skinny Jeans (go up one size, review and measurements here). I am contemplating this dark blue pair from the sale. 1. 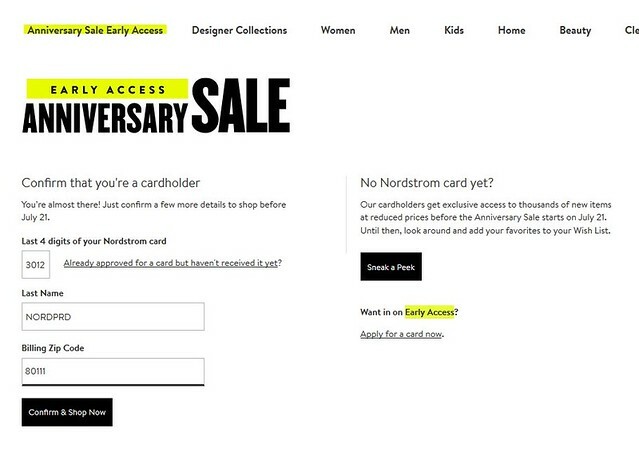 No need to sign up for a credit card to shop Early Access – If you don’t have a Nordstrom card check out the below tip for how to gain access to shop the #nsale without being a credit card holder. Hopefully this tip still works this year (update: thanks to those who confirmed in the comments that this tip worked for you!). I have a Nordstrom Rewards card to earn rewards points only (not the credit card) and I was able to order online with this workaround. However, you should be able to shop using this workaround without signing up for the credit card or rewards card. When browsing an Early Access product you’ll see the option to ‘Confirm Card to Add to Bag‘ right below it. Enter the following values and then click on the ‘Confirm & Shop Now‘ button to shop the sale! 2. Don’t sweat it – Per Annie‘s helpful tip from 2017, Nordstrom will honor the sale price of an item that has been restocked only if your #nsale order was cancelled. Therefore, I wouldn’t sweat it if you miss out on an item due to a cancelled order as long as you don’t mind online stalking an item. I bookmark the item’s page and check at random times throughout the day for pop-ups in the size/color I want. After all, fall weather is still far out and I wouldn’t want to spend 3 weeks of summer shopping solely based on a fear of missing out. In 2017 the only purchase I made were for the top selling Vince Camuto Fileana Split Shaft Bootie (review here) in September well after the #nsale had ended. I had tried to order the booties during the sale only to have my orders cancelled twice so they price matched the sale price when I did finally manage to order them in September. In full disclosure, I ended up returning them since the style didn’t fit my feet comfortably so technically I didn’t keep anything from the 2017 sale. 3. Nordstrom and Nordstrom Rack accept each other’s returns – This is yet another helpful and convenient tip I’ve learned from Annie in case you don’t have a Nordstrom store near you. This article (short and sweet) and this article (more in depth) both confirm how and why cross-chain returns are possible. I’ve only tried this once last year. The politically correct response from Nordstrom Rack employee I asked was that they accept Nordstrom returns as a courtesy to their customers. 4. Be wary of restock alerts – Items will get returned and be back in stock online in random sizes and colors throughout the sale (and well after the sale has ended). I believe this is due to many people ordering multiple sizes and colors. However, items that frequently get restocked in almost all sizes and colors may also be due to poor fit, poor quality or both. Most of us can’t wait to return something we don’t love fast enough but the majority will not bother to leave a helpful review. Update 8/5: I reviewed a few more items here. Update 7/28: I reviewed a few more items here. Update 7/20: My review with pictures and a video clip of my try-ons is available here. If you’re on Instagram you can always refer to my NSale highlights as items arrive and before I’m able to update my blog. Hinge Puff Sleeve Lace Top (sale price: $38.90) – My friend Su shared this pretty top with me as seen on Liz Adams. I ordered size XXS to try in ivory. Update 7/16: I received this top in the mail today and the lace is pretty but you will need to layer it with your own camisole. Size XXS has a generous fit and the measurements are as follows: 36″ bust, 12.5″ sleeve length, 48″ circumference along the bottom hem and 24″ total length. Sadly I will have to return this top due to the oversized fit. Gibson Convertible Cozy Fleece Wrap Cardigan (sale price: $45.90) – I ordered the grey white (stripes) color in size XXSP to try. Update 7/17: Due to the more open length and relaxed fit I would recommend sizing down one size in this cardigan for a closer fit. Size XXSP fits more like size XSP. The measurements of size XXSP are: 22″ sleeve length, 25″ total length. BP. Raw Edge Scoop Neck Tee (sale price: $18.90) – I ordered size XXS in the beige bark and stripe colors. Update 7/17: The striped tee and the beige bark color fit differently even though I ordered them in the same size. The beige bark color is more snug especially through the body (34″ bust measured pit to pit, 24.25″ front length, 26.25″ back length) and it’s also more thin/sheer than I prefer. The striped version has a more relaxed fit (35″ bust measured pit to pit, 25.25″ front length, 27.25″ back length). Also, the sleeve length of the solid beige bark color is 24.5″ while the ivory Liz striped tee is 22.5″. 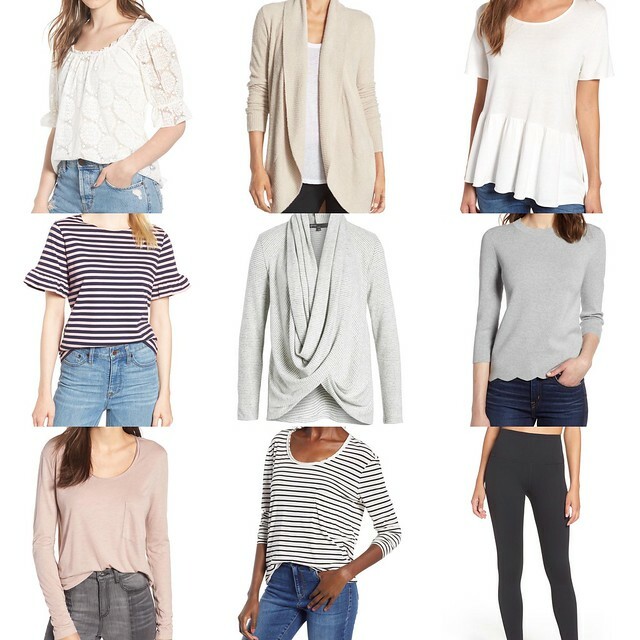 Halogen Scallop Edge Sweater (sale price: $39.90) – I love anything with scallops and I ordered the the grey color in XSP. I remember trying it on in red last year but I recall that my fitting room pictures did not save last year due to issues with my old iPhone. Update 7/17: The sweater is very soft and comfortable and it fits true to size. Sadly I didn’t love the how the sweater fit me and I will be returning it. There’s something about how it drapes against my body which suggests that I may need to size down for a closer fit but then I think it would be too snug at the waist. The measurements of size XSP are: 31″ bust (measured pit to pit), 13″ shoulders, 17″ sleeve length and 22.5″ total length. Caslon Peplum Top (sale price: $32.90) – I ordered size XXSP in ivory cloud to try since the Caslon brand has very generous sizing. Update 7/17: The fabric is an ivory color and the material is soft and slightly see through. Size XXSP has a very generous fit but the material falls nicely if you don’t mind loose babydoll tops. Size XXSP fits more like a regular size medium and the measurements of size XXSP are: 40″ bust, 24-25″ asymmetrical length, 44″ around the start of the peplum hem flounce. J.Crew Ruffle Sleeve Tee (sale price: $32.90) – I ordered the blue pink stripes in size XXS. Update 7/17: This tee has a cropped fit and runs small. Size XXS regular fits more like a LOFT size XXSP. Size XXS measured: 34″ bust (measured pit to pit), 14″ shoulders, 36″ along the bottom hem and 22″ total length. Barefoot Dreams® CozyChic Lite® Circle Cardigan (sale price: $76.90) – I have yet to try everyone’s favorite cardigan so I ordered the stone color in size XS/S to try. This cardigan looks very oversized on similar size petite bloggers that I follow. Update 7/17: This cardigan feels like a soft fleece blanket. To me the stone colors’ fabric looks like the matted fur of a child’s favorite stuffed animal that needs a good wash. The sleeves of size XXS measures 25″ long and when I measured from the longest part in the back it is 31″ total length. The fabric is made of 75% nylon and 25% rayon. I loved the feel of the cardigan but the sleeves were too snug on me and the overall length doesn’t quite work for me since I’m petite. It’s crazy that it costs almost $80 even on sale. Zella Live In High Waist Leggings (sale price: $35.90) – I have also yet to try everyone’s favorite leggings. I’m afraid the inseam may be too long on me since it doesn’t come in petites but I ordered size XXS to try anyway. I probably should have ordered this cropped pair to try. Update 7/17: The waist of size XXS fits me well but the legs fit very slim which works for my thin legs. Size XXS has a 29″ inseam. I cuffed the extra length and the inseam is about 4.25″ longer than I prefer (I prefer ankle length petite jeans between 25-26″ and I’m 5′ 2.5″). The leggings are soft and not stiff and they appear to be well made. I decided to order the cropped version to try in size XS since size XXS is very snug. BP. Textured Stitch V-Neck Pullover (sale price: $25.90) – I ordered size XXS in grey bark. Update 7/23: See it on me here. Louise et Cie Bayne Loafer (sale price: $89.90) – I ordered the Light Mink Patent in my usual size. The black color is very chic. Update 7/23: See it on me here. 1.State Sisteen Half d’Orsay Pump (sale price: $59.90) – I ordered the neutral Cipria leather color in my usual size 7. Update 7/26: See it on me here. Topshop Lily Knit Back Midi Coat ($82.90) – Kendall reviewed this chic menswear inspired camel coat in her Instagram stories. Update 7/16: I caved and ordered this coat in size 2 (supposedly fits like size 0). I’ve been wanting a camel coat and I’m hopeful that it will fit me well since the J.Crew Factory wool topcoat did not work out for me (review here). The coat is currently backordered with an estimated ship date of 7/20 so it will be some time before I receive it. Update 7/31: Nordstrom still has yet to ship out this coat. Here are some other items I am eyeing. I feel like I need to check myself since I feel like I already ordered a lot. Topshop Jamie Petite Step Hem Skinny Jeans in dark blue (sale price: $49.90) – I have the Jamie style in white as mentioned at the top of this post. Nasreen reviewed these jeans in her Instagram stories. Update 7/18: The size I wanted popped back in stock today so I ordered size 26W x 28L petite to try. Update 7/31: I should receive them by 8/3 but I am out of town until 8/5. Paige Hoxton High Waist Ankle Skinny Jeans (sale price: $109.90) – These ankle jeans look petite friendly and I love the medium wash. I have a hard time justifying paying over $100 for jeans when LOFT and Ann Taylor always have good sales for equally awesome jeans. Caslon Asymmetrical Drape Collar Terry Jacket (sale price: $52.90) – I wanted this jacket in the olive color in size XXSP but my size and color is sold out for now. This jacket is highly recommended by Annie both last year and this year. Badgley Mischka Double Face Wool Blend Wrap Front Coat (sale price: $229.90) – I love the color and it comes in regular and petite sizes but the sale price is still pricey for a coat I won’t need for months. Update 7/13: This coat is currently sold out online. Madewell Ryder Cardigan (sale price: $64.90) – This cardigan looks so chic. Calson Dolman Sleeve Sweater (sale price: $39.90) – I loved this sweater on Lilly. Topshop Stripe Hoodie (sale price: $32.90) – This hoodie and the matching joggers look so good on Rachel. RevitaLash Advanced duo (sale price: $98) – The positive reviews make me want to try out this lash serum. I have never tried any lash serums before but I also heard good things about Latisse. Lucky Brand Yabba Wedge Bootie (sale price: $86.90) – I am eyeing the sesame suede color and I saw these booties in Courtney‘s Instagram stories. Update 8/1: My size in sesame suede popped back this early morning so I ordered them to try. Nordstrom Chevron 20-Inch Spinner Carry-On (sale price: $103.90) – Get the 20″ and 29″ set for $223.90. I’m shopping for a spinner and this one looks both cute and functional. I have yet to own a spinner and for our short weekend trips I still default to using the the Ricardo luggage my parents gifted me during in college (I graduated in 2005). Longchamp ‘Le Pliage’ Expandable Tote (sale price: $129.90) – I review this expandable tote here compared to the other sizes I own. I like the olive (new khaki) and the pinky color which already sold out for now as I update this post. Diptyque candle set (sale price: $55) – My favorite candle set is back.You can see the sizing compared to the full-size 6.2oz candle here. You can check out my other past season #nsale reviews below. I’d love to know if you have any recommendations or if there’s anything you’d like me to review.